2017 was a historic year for Kurds. On 25th September, 93% in South Kurdistan voted in a referendum in favour of independence for the Kurdish Region of Iraq. In Northern Syria the Kurdish led Syrian Democratic Forces (SDF) captured Raqqa ensuring the defeat of ISIS in Northern Syria. In Turkey the leaders of the pro-Kurdish Peoples Democratic Party (HDP), Selahatin Demirtas and Figen Yuksekdag were presented in court, after over a year in prison, on fabricated terrorism charges and protests were held following false rumours of the death in prison of Abdullah Öcalan, leader of the Kurdistan Workers Party (PKK) and recognised leader of the Kurdish freedom struggle. In todays’ international context Kurdistan is cut up between Iraq, Turkey, Syria and Iran. These states, created by British and French imperialist policy after the First World War, have for a century denied the right of Kurdish citizenship, the use of Kurdish languages and even for people to identify as Kurds. Kurds have protested against these injustices again and again, demanding their human, democratic and national rights but have been met with violence, arrests, tortures and deaths. Seeking self-determination has been a difficult task for the Kurdish people within each of these four false states. In South Kurdistan it has also been hampered by the disunity of the Kurdish political parties. In recent years the Kurds of South Kurdistan have come to the World’s attention as the best fighters against the brutal forces of Daesh in Iraq. In South Kurdistan Peshmerga’s forces with PKK support, reclaimed Sinjar from Daesh who had been committing genocide on the Yazidi people. In 2014 Iraqi government forces abandoned or were pushed back from some areas by Daesh, some of which were then taken by the Peshmerga armed forces of the Kurdish Regional Government (KRG) who took control of these, predominately Kurdish areas. Some of these areas, including the major city of Kirkuk, were the ‘disputed territories’ that the KRG have argued should have, since the inception of the KRG after the fall of Saddam Hussein, been part of its territory. Disputes between the KRG and the Iraqi government, particularly over the distribution of the proceeds from oil production in the Kurdish region, have been going on for years. The Iraqis withheld monies and the KRG exported oil directly to Turkey. Oil companies, at Baghdad’s request, delayed payments of royalties due to the KRG. An economic crisis developed and the KRG stopped paying salaries to public servants causing severe hardship. The divisions between the main political parties, the KDP and PUK, worsened. These parties, based on clan lines, have dominated the KRG since its inception and whilst revenues were healthy they were able to divide the rewards amongst them and their party supporters and families. The KDP leader Massoud Barzani served 2 terms as President but then used his majority to suspend parliament when he wanted to continue into a third term contrary to the constitution which limited anyone to 2 terms as President. The suspension of democracy and the increasing corruption of state and economy further developed a political crisis that only the arrival of Daesh and the need to mobilise to defeat them put on hold. The calling of the referendum was seen by many as an attempt by Barzani to legitimise his claim to continue as President. The referendum was opposed by neighbouring Turkey and Iran, fearful of the impact an independent Kurdish state would have on their own Kurdish populations’ demands for greater rights, and by the EU and the USA. Within South Kurdistan, concerns about Barzani’s motives for the calling of the referendum were put aside by most people and support was rallied to achieve a national declaration of support for independence. As predicted by many Kurds, the Iraqi government condemned the referendum as illegitimate and unconstitutional and Prime Minister Haid al-Albadi took immediate steps to penalise the Kurds by blocking international flights to the Kurdish Sulaimanyah and Erbil airports. Troops also blocked routes between Mosul and Dahuk and other major cities. At the same time Iran and Turkey instigated threatening military movements and threatened to cut off the supply of food and stop the flow of oil revenues. Iraqi forces were diverted from the continuing fight against Daesh to move into the ‘disputed territories.’ Kirkuk itself was taken by Iraq’s forces within days as Peshmerga forces withdrew. This included deals done by one faction of the PUK with Iran which made any physical resistance to the Iraqi advance impossible. The outcome of the referendum has therefore been a huge setback to Kurdish aspirations with the KRG weaker than it has ever been. Its autonomy and ability to develop its own international relations has been severely curtailed, its economy is weakened further by the loss of the ‘disputed territories’ and the political crisis has been brought into sharp focus with Barzani agreeing to stand down as President but with no clear path to a proper restoration of even the weak democratic structures that existed previously. Attempts to develop a modern, oil-based economy on a tribal division of power have created a failed statelet, to add to the other failed states in the region. In contrast, the experience of the Kurds in Syria, starting in the majority Kurdish region known as Rojava (West Kurdistan), has been different and created an entirely different democratic outcome. Famous for their fighters in the People’s and Women’s Protection Units (YPG and YPJ) that defended the region against Daesh and form the core of the SDF who have defeated them recently in Raqqa, the Kurds have advocated an ideology of Democratic Confederalism where society is organised, not on tribal and patriarchal lines, but on bottom-up democratic, secular and gender equal structures. 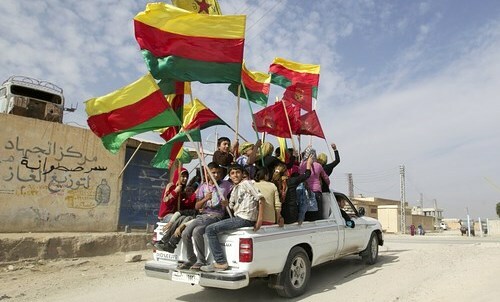 Originally introduced in those areas where the Syrian state forces withdrew and the local people, influenced by the years of political struggle of the PKK and Abdullah Öcalan, had to create new structures to run their communities and services, the model has expanded to those areas liberated from Daesh. Arab, Assyrian and mixed communities have been encouraged to organise their own structures on these lines. Elections for the local and sub-regional structures were successfully held with high levels of participation towards the end of 2017. Elections for the North Syrian Regional parliament are due in January 2018 with this Confederal model being proposed as the future for Syria post the civil war. This revolution in grassroots democracy, that ensures minority rights are protected and women have equal status, is the real Kurdish contribution to the region. It respects the current national borders but argues for a democratic solution to years of national oppression of the Kurds, and other minorities, and puts power in the hands of populations and not chieftains, mullahs or dictators. The Kurdish people have suffered under endless conflicts and wars. Through the Persian and Ottoman Empires, Anglo-French imperialism, oppression in the modern states, victims in the Iran-Iraq war, suffered the chemical gas of attacks under Saddam Hussain, Daesh genocide against the Yazidi, Turkish government curfews on towns with the death of hundreds and the imprisonment of thousands, Turkish attacks on Kurdish targets in Iraq and Syria up to the recent 2017 Iraqi militia invading Kirkuk and killing Kurdish people who stood in their way. The recurrence of war and conflict has been the Kurdish experience. We have not been allowed to develop as a nation, to develop cultural institutions and democratic movements. We have had no period of stability and peace. The efforts in South Kurdistan to create a nation have run up against this lack of a democratic ideology and culture. The traditional leaders have sought to replicate the creation of a state along the lines of the other states in the region, autocratic, patriarchal and capitalist. Whilst women have become widows and saw their families torn apart in conflicts, left behind in a society with no care or benefits, increased poverty, unemployment, corruption and economic crisis, the elite have struck oil deals with our enemies behind closed doors to enrich only themselves. However the heroism of the Peshmerga, YPG and especially the women of YPJ fighting against Daesh, the struggle for democratic progress in Turkey of the HDP and the ability of the people of Rojava to organise society on democratic and equal lines shows that the struggle for freedom will continue and that the ideas of Democratic Confederalism are essential for success. Sympathetic as I am to the creation of an autonomous Kurdish homeland and assuming there is agreement among Kurdish politicians as to what form that homeland ought to take within the landlocked Turkish, Iraqi, Irani context, the question of the so-called Assyrian ie Syriac Christians also requires urgent examination. The record of the Kurds within the old Ottoman imperium is not a good one. Kurdish tribes were the instruments of the Sublime Porte’s suppression of Armenian and Syriac Christians and frequent massacres, ethnic cleansing and population displacement has been the pattern until now. The Syriac Christians inhabitated this region before the Arabs and Kurds and like the latter they too need a safe place to be allowed to prosper. Only a Kurdish government, an enlightened and tolerant one, could guarantee this as neither the current Turkish or Iraqi régimes nor the UN for that matter seem unduely troubled by possible extinction of this ancient culture in its native land. What’s new, the English, aided and abetted by the C of S and the Education system of the 18th/19th and 20th centuries tried to kill off Gaelic (Scottish and Irish), Scots, Doric, Shetlandic etc so let’s not be too quick to criticise others. For those of us who support Gaelic should be grateful to certain Christian Branches in the Highlands and Western Isles who kept the native language alive e.g. The Gaelic Psalms of the Wee Free’s. I agree with the author’s viewpoint that an oil-based state with power and wealth based on patronage and so on is backward-looking and effectively doomed. If external threats are removed, internal in-fighting may increase again. On the other hand, if the new Kurdish state became a model of successful Democratic Confederalism then powerful forces would surely conspire to destroy this good example, starting with covert means. It seems like a problem that needs to be approached on many different levels, from reform of the UN to small-scale collective improvements on the ground. Keeping the coverage of Kurdistan in the news is beneficial, but also developing some kind of sustained Kurdish cultural export might help humanise calls for support.